Many Makers have been asking us here at LibDib about pricing. They want to know how best to price their products and then submit an offering to restaurants, bars and retailers. My nearly 20 years of experience has given me a little bit of knowledge about what buyers expect when it comes to pricing in a competitive marketplace. However, it is ultimately up to you as the Maker to decide how much you want to be paid for your products. And pricing really does matter. If you price your products too high, buyers might be hard to come by. If you price too low, your products could appear on the shelf for lower than you would prefer. So, let’s get down to the question at hand: How should you price your products on the LibDib platform? When I was working at my family’s winery, I would do a simple math problem (I am kind of bad at math, so simple is necessary). The FOB (the price I sell my wine to distributors) price was half of retail. If I sold my wine for $40 per bottle, then I would sell it to the distributor for $20 a bottle or $240 per case. In most cases, the distributor would ask for extra “marketing spend” or Depletion Allowances (DAs) for programming or QDs (Quantity Discounts). So that $240 was never the total amount of money I would receive for my case of wine (that’s a whole other blog post for later). Keep in mind there is no extra “spend” with LibDib as your distributor. Often a $40 bottle of wine retail will show up on the menu at a restaurant for $80. Consider “By-The-Glass” pricing and usually the cost of the bottle is the glass price. A $120 case of wine at $10 a bottle will be $10 a glass. Margins on food are low, so restaurants make it up with the sales of alcohol. 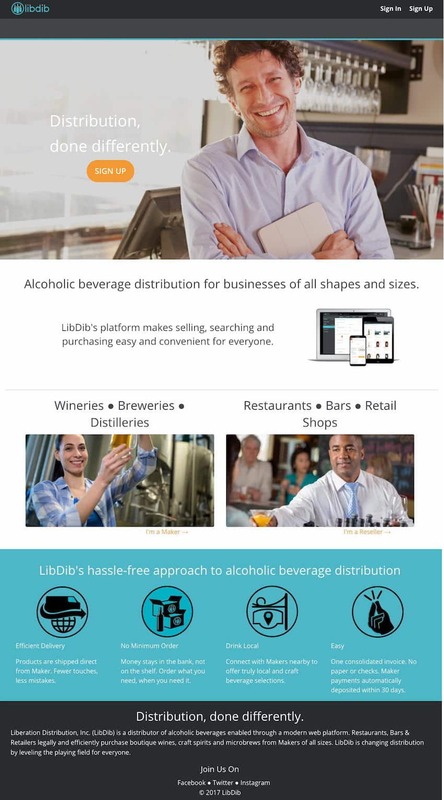 With LibDib you have the choice to save money OR to give the retailer an opportunity to make more margin and therefore choose your product over other commodity items that are traditionally pushed by big distributors. Half of retail is still $240. Now, add YOUR cost of shipping to this. Say it’s $25, which brings a case total of $265. The LibDib margin is 15% (which translates to a 17.65% markup) bringing it to $311.76 for the buyer. Assuming the retailer marks it up 40%, the total is $436.47 per case or $36.37 per bottle. Round that up to $36 per bottle. You can keep that $2 (or $24 per case!!) for yourself and put your price in a little higher, or you can offer it to the retailer in extra margin. Make sense? For more about LibDib’s margin and why it is different in each state, please click here for my previous discussion on the matter. I often say that the LibDib model saves money. I have demonstrated this above with straight up math (I LOVE math…not). ·Incentives: Often to the sales reps in the form of trips to wineries, gift cards, gas cards, and straight up cash. Each state has different rules about that. However, if you can’t afford to be in the incentive game, your competition can. What product do you think the sales rep is going to push? The one that earns an extra $10 per case plus the opportunity to win a trip to Italy? Yep. o FSA: Floor Stock Adjustment: This is a fun one and can be thousands of dollars. When old inventory needs to be cleared out to make way for new inventory, it gets discounted. End of vintage or a new SKU. Or, when you realize your wholesaler is not doing their job you go to another distributor and they have to pick up aged inventory. You pay the wholesaler laid-in, then discount to the new wholesaler. The joys of cleaning up a mess. Super fun to coordinate (is there a sarcasm font here?). Obviously, the cost of shipping is a big expense. The lower the shipping is, the better solution for everyone. Give us a call and we can help find solutions through our partner warehouses, special common carrier rates and other ways to save on shipping. This is something LibDib Central Command will always be working on for our Makers. As we scale, we hope to provide better solutions for all. The lower the shipping rates, the more dollars available for “feet on the street,” which is the next blog (coming soon).